Sailors, ahoy! Your island is facing a danger from sea pirates, and why wouldn’t it?! You have a whole lot of gold lying down there! Climb into your chopper and gun down all those thieves. Protect your gold and save your island. Yeah, Island Loot is that exciting game! Move your mouse to navigate your chopper. Click to shoot at the approaching pirate ships. Remember! Once the ship hits the island, it becomes immune to your bullets. Keep a watch on the Health Meter of your chopper and the Attack Meter of the ships. 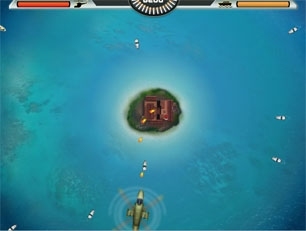 Collect bonuses along the way – sharks, sea mines and bullets! Win the Captain Island Medal for a nifty score of 22,000!